For the first time ever in the U.S., fans can join in the raucous adventures of Tintin and his loyal dog Snowy. Experience the excitement and wonder of The Adventures of Tintin at home before you head to the theaters for the brand new major motion picture that weaves in elements from the stories "The Secret of the Unicorn," "The Crab with the Golden Claws," and "Red Rackham's Treasures" that are among the first five episodes of the series and included on this DVD set. A Classic Comic Strip Comes To Life In An Animated Adventure For The Whole Family! ON DVD FOR THE FIRST TIME EVER IN THE U.S. The all-time classic comic strip comes to life as an animated adventure in this complete Season One DVD release on November 22 from Shout! Factory, in association with Corus Entertainment Inc.'s Nelvana Enterprises. For the first time ever in the U.S., fans can join in the raucous adventures of Tintin and his loyal dog Snowy. Experience the excitement and wonder of The Adventures of Tintin at home before you head to the theaters for the brand new major motion picture that weaves in elements from the stories "The Secret of the Unicorn," "The Crab with the Golden Claws," and "Red Rackham's Treasures" that are among the first five episodes of the series and included on this DVD set. Adapted from the long-running graphic novels by the late cartoon artist Herge (a.k.a. Georges Remi), the popular animated TV series The Adventures of Tintin, co-produced by Nelvana and Ellipsanime Productions, chronicles the young and intrepid investigative reporter Tintin and his faithful dog Snowy, along with Captain Haddock, the muddled genius Professor Calculus, and the bumbling detectives Thompson and Thomson as they embark on incredible globe-trotting adventures full of excitement, mind-boggling mystery and fun. Originally created as a French comic strip in the late 1920s, The Adventures of Tintin spawned a series of popular graphic novels, translated in 80 languages and published in over 50 countries. 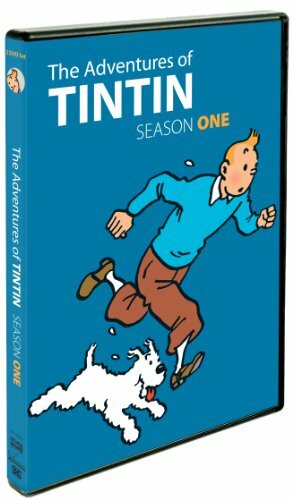 Throughout the years, Tintin and a unique cast of characters have evolved into memorable animated TV series (1990s), a BBC radio series (1992), stage plays, as well as the upcoming 3D motion capture feature film The Adventures of Tintin: The Secret of the Unicorn. The complete first season of the award-winning series is now available for your enjoyment with 13 original episodes on 2 adventure-packed DVDs! Nelvana Enterprises is owned by Corus Entertainment Inc., a Canadian-based media and entertainment company. Corus is a market leader in specialty television and radio with additional assets in pay television, television broadcasting, children's book publishing and children's animation. The company's multimedia entertainment brands include YTV, Treehouse, Nickelodeon (Canada), W Network, OWN: Oprah Winfrey Network (Canada), CosmoTV, Sundance Channel (Canada), Movie Central, HBO Canada, Nelvana, Kids Can Press and radio stations including CKNW AM 980, 99.3 The FOX, Country 105, 630 CHED, Q107 and 102.1 the Edge. Corus creates engaging branded entertainment experiences for its audiences across multiple platforms. A publicly traded company, Corus is listed on The Toronto Stock Exchange (CJR.B) and New York (CJR) exchanges. Experience Corus on the web at www.corusent.com.